umor, insight, and rough edges-a fascinating read. Suffused by a yearning for what has been lost, these narratives are both experimental and traditional, humorous and disturbing, and confirm without doubt that Alemeddine is one of the most original and accomplished young writers to emerge in some time. "is unflinching: lonely, angry, sad and mournful, yet often luminescent with love. This is a book filled with humor, insight, and rough edges-a fascinating read." If, on the other hand, you favor literature that challenges you down to your conscience, then you really must read this book. More rigorous that Alameddine’s debut novel, last year’s critically acclaimed “Koolaids,” “The Perv” provides a painful, bitingly electric experience for the reader, as well as a credible and necessary look into the thoughts and feelings of people rendered outcasts by forms of social cruelty. For those not familiar with this experience, the book is a must. Though at times brutally frank and lacerating in its depictions of cultural and social oppressions, the collection is gracefully written: sharp, direct and elegant without ranting, arch condemnation. “The Perv,” despite its title, with its lamely subversive feel, faces four of the big truths – sickness, desire, alienation and death – with a caustic honesty as sincere as Jonathan Swift’s or Lenny Bruce’s. And, like Swift and Bruce, the cumulative effect of these stories transcends gay/straight, foreign/domestic and all of these structural limitations of the ways we think. The book is ultimately an affirmation of the tough resilience of alienated people, as well as the hard wake-up call to the people who have no clue about them: Watch your back; you may have created a beautifully coherent nightmare. 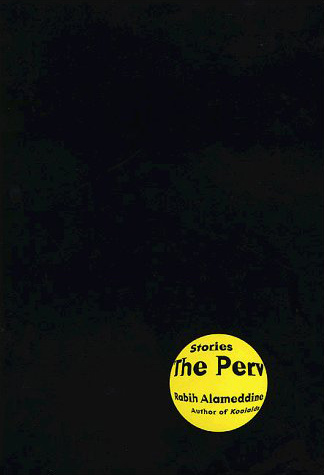 Rabih Alameddine's THE PERV is an excellent book of stories which has received no notice in any newspaper or magazine (perhaps because Hollywood junkie Jerry Stahl has just published a novel also called Perv). Alameddine is a painter as well as the author of a novel, KOOLAIDS: The Art of War. His new collection of stories, THE PERV, displays a pattern of formal experimentation more typical of painters than of authors -- while extremely various in form and structure, the eight stories in this collection share a sensibility and a palette. They return again and again to the same subjects (Lebanon, displacement, bigotry, AIDS, the burden of memory) and the same emotions (primarily peevishness and longing) even as the author's narrative strategies shift. Several stories employ the conventions of memoir -- chronological recollections told with the irony and omniscience gained with time -- while others are simply collaged fragments of first-person observations, memories, and documents blending disparate times and incidents.